The proverbial glass is always half full for me. Some say, “Cleo can find the good in even a garbage pile.” That’s true. For an art project in college, I water-colored a pile of overflowing trash cans in a back alley in an artistic manner. The professor gave me an “A” and lectured the class about finding beauty in unusual places. Meanwhile, back to that half full glass. I now believe that half full or half empty does not matter anymore. The glass can be refilled at any point. What an anxiety breaker. The point is that gratitude is an attitude that can envelope a person’s being. An acknowledgement of the goodness in life. A connection to something outside of self. In my case, recognizing the hand of God in all of life, especially the difficult times. A state of gratefulness can permeate any event or conversation like the aroma of cinnamon and nutmeg when a pie bakes to toasty perfection in a hot oven. Thanksgiving is more than a time of the year to tempt myself with all the food that is not on the Weight Watchers’ list. It is a day to stop and contemplate the people in my life who make it worthwhile to get out of bed and slip into my fleece bathrobe. For one 12 hour cycle, my thoughts concentrate on how God has worked in my life for a year. A whole year. Lots of space for gratitude. Lots of time for “thank you” all around. Thanksgiving gives the pause for reconnecting with what is important in life. Gratitude is a cup that is refilled daily. Every day. Every hour. Every minute. Taking one day to capitalize on that emotion is a way to energize my capacity for appreciation. All the way to the top. And, amazingly, my cup is overflowing. Write a thank-you note. No, don’t e-mail, text or phone a thanks. Sit down, take out some paper and write a note with a pen using the best handwriting your fourth grade teacher insisted upon. Talk about how the person has made an impact on your life. Express appreciation. Do this at least once a month. Mentally thank someone. Late at night, lying in bed with sleep eluding the opened eyes, don’t count sheep. Think about the person who has made the day a little easier, and mentally thank them. Keep a gratitude journal. Every evening, just before turning in, write down the good things that have happened during the work day, on the way, or through conversation. Read back pages and remind yourself of how fortunate you are in life. Remember the hymn. When is the last time you sang the song, “Count Your Blessings”? Name them one by one. Give thanks with a grateful heart. Pray and praise the One from whom all blessings flow. Mail out Thanksgiving cards to those who do not have connections with positive events. It can serve as a reminder to them that a change in attitude may bring a measure of It’s worth the cost of the stamp and a box of drug store greeting cards. 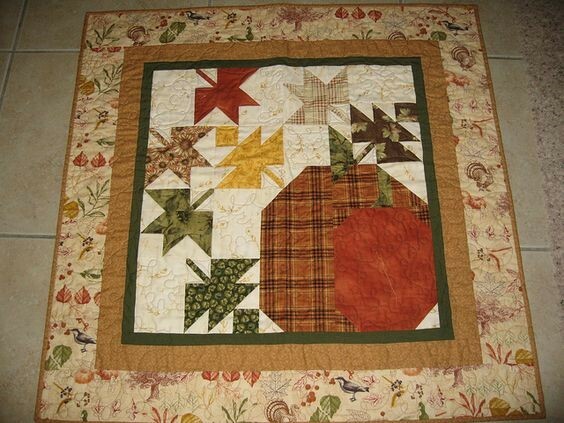 Regard that old saying, “When life gives you scraps, make a ” Maybe creating a quilt of thanksgiving is too ambitious. 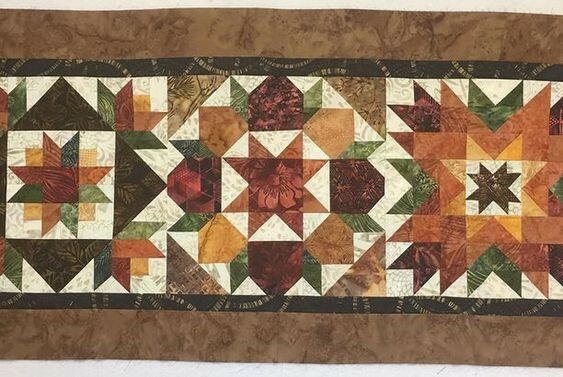 How about stitching up a table runner that with the visual feast found in the warmth of the seasonal hues of gold, crimson and pumpkin? Or a wall hanging to greet guests with a comforting welcome? 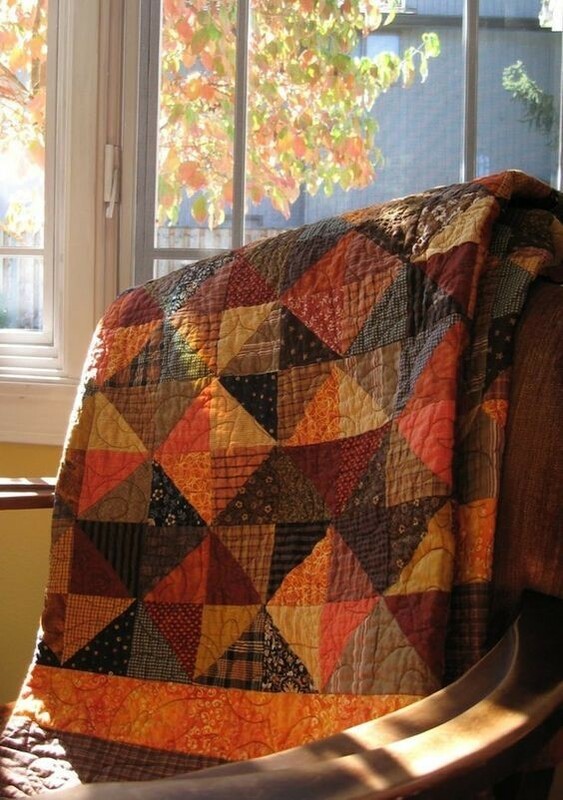 Bind these fabric masterpieces in gratitude.